The good news is that in the Chicago area Santa’s gift bag overflows with holiday celebrations. The bad news is that a visitor would need two weeks to zoom from one holiday treat to the next and would still arguably fall asleep at dinner totally exhausted. Best plan is to limit the sights according to age, interest and time. 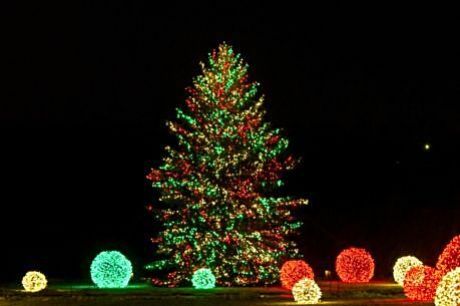 But with so many choices from shopping and shows to light and tree festivals, picking a few items is challenging. As a life-long Chicagoan who has also covered holiday happenings for 30 years, I have sifted through Santa’s bag to pull out five fun treats. Feel free to add your own thoughts down in comments. 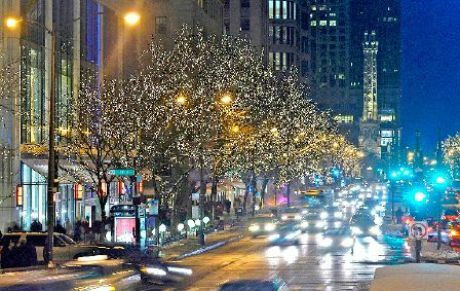 Macy’s (formerly Marshall Field’s) windows and Walnut Room Great Tree are a destination for locals and visitors. Moving along the State Street side of Macy’s to peer into each window has become a tradition for many Chicagoans. Even our adult, California daughter wants to see the animated fantasy stories depicted when she comes in for Thanksgiving. The fun continues inside where store decorations are a wow and the Walnut Room’s tree on the 7th floor is a must see. To eat under the tree, make a lunch reservation ahead of time. Visitors often put the Art Institute of Chicago on their must do list. But at holiday time it’s the museum’s Thorne Miniature Rooms that draw the crowds. About 11 rooms are decorated for the holidays. However, from grand halls and Victorian estates to elegant 20thcentury art deco, all the miniature rooms are worth a visit. While downtown, get tickets to the Goodman Theatre’s “A Christmas Carol.” Another Chicago tradition, the production of Charles Dickens’ holiday story is an audience pleaser. The sets and acting are magical. Chicago’s famed Magnificent Mile begins north across the Chicago River on Michigan Avenue. The best time to shop and enjoy its holiday lights is after the sun sets. Not a problem now that Illinois has turned the clock back an hour, twilight comes by 4:30 p.m. However, after shopping or browsing go upstairs to the Signature Lounge on the 96th floor of the John Hancock Center for its spectacular lakefront and city views and a relaxing break from holiday bustle. North of the city in suburban Glencoe, the Chicago Botanic Garden turns on 750,000 LED lights and starts up its trains for Wonderland Expressbeginning Nov. 29, 2013. Visitors feel like they’re sightseeing among miniature Chicago area museums, skyscrapers, stadiums and homes built from natural materials in the Regenstein Center as G scale trains and an “L” shoot along overhead and foot-level tracks. The garden is free during the day although there is a car parking charge. Timed tickets are required at night but Wonderland is worth seeing.